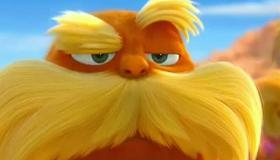 It took a while for Dr. Seuss to find big screen success but with How The Grinch Stole Christmas and Horton Hears A Who finding major box office bucks (the less said about Mike Myers' take on The Cat In The Hat, the better), now comes a charming and surprisingly meaningful version of his 1971 environmental warning, The Lorax. The result is a smashing kids movie that doesn't stint on sending a message about the care of the planet—informative and valuable advice for moviegoers of all ages. On top of that, this is purely warm, wonderful, wise and hilarious family entertainment that is fantastic movie fun for everyone. Move over Grinch and Horton, there's a new guy in town—and with little kiddie competition to block its way the Lorax should find tons of box office green to line Universal's coffers throughout March. With exquisite use of CGI animation and 3D imagery, director Chris Renaud—who, along with Chris Meladandri's Illumination Entertainment, gave Universal one of its few major animation hits with Despicable Me—has done it again by creating a happy colorful world decimated by greed and carelessness. Theodore Geisler (aka, the Dr. himself) would be proud at this fitting tribute to him and his wife, Audrey (an executive producer and head of the Seuss empire)—even the two main human protagonists are named after them. Ted (voiced by Zac Efron) is a 12-year-old hotshot who falls head over heels for Audrey (Taylor Swift) and sets out on a quest from the imposing walls of Thneedville to find her the mythical Truffula Tree, the only one left of its kind. Along the way, his journey leads him straight to the scary, prison-like home of the Onceler (Ed Helms) who tells Ted a tale of pure greed and his part in it. This land once ignobly hosted the eventual exodus of all its creatures, wiping out the gorgeous rainbow-colored plants, trees and flowers of the whole valley even as the legendary Lorax (Danny DeVito—who else?) tried in vain to stop the cull. Armed with this information and the Lorax itself, Ted is determined to bring the Truffula Valley back to its former glory in a pitched battle with current villain Aloysius O'Hare (Rob Riggle), the town's number one polluter who pushes bottles of "fresh air" for profit. There is much for both kids and parents to love in this film: it's a sweet nostalgic trip for the older family members and is candy-coated just enough for the tykes. The voice cast delivers the lines of screenwriters Cinco Paul and Ken Daurio's smart adaptation with pitch-perfect precision, with special shout outs to Helms, DeVito and the wise old Granny voiced with gusto by the indefatigable Betty White. Of course, it already has its critics. Political pundit Lou Dobbs has called the film and its strong pro-environment message a pitch by Hollywood liberals to help President Obama. Apparently he missed the fact that Geisel wrote it in 1971. Election year aside, it's safe to say whoever sees The Lorax will never look at a tree the same way again.